There’s little doubt that self-care is growing in popularity — and not just among millennials. People of all ages and seasons of life are seeing the value of preserving good health. New grads, new parents, empty-nesters, retirees, divorced or widowed individuals, and those in the midst of other major life transitions are learning just how important having a solid self-care plan is to their long-term well-being. From saving money on the ever-increasing cost of healthcare to saving time to finding more balance in general, self-care is a powerful tool that we can use to live a full and joyful life. Even physicians are beginning to invest more time in education and empowerment, and patients are taking greater interest and ownership of their health by becoming active directors of their care. At Living Upp, we define self-care as a preventive health strategy involving actions and behaviors that improve, restore, or maintain good health. And for those who may be managing existing health conditions, self-care also includes preventing the progression of disease. Self-care activities include exercising, bandaging wounds, icing or heating injuries, taking medication, testing blood sugar or blood pressure, getting restful sleep, preparing healthy meals — and just about anything that can be performed safely by an individual to support good health. In fact, self-care is the most widely practiced form of health care in the world. Not only is it more affordable than professionalized care, it’s also the most powerful preventive tool we have when it comes to preserving good health. The term “self-care” has been trending upward as a Google search term in recent years, but it’s not a new concept. According to the World Health Organization, self-care is “the most dominant form of primary care in both developed and in developing countries,” and it has been estimated that “65% to 85% of health care is provided by the individual or the family without professional intervention.” Likewise, in the UK it’s been estimated that 80% of all care is self-care. Self-Care isn’t a trend; it’s a basic human right. And it’s becoming a movement. As far back as 1978, the International Conference on Primary Health Care (Alma-Ata, USSR) declared that “people have the right and duty to participate individually and collectively in the planning and implementation of their health care.” In fact, some consider self-care an act of civil disobedience in today’s commoditized healthcare climate. So why is self-care making so many waves? Let’s face it: Health care is expensive. According to the CDC, healthcare was 17% of the GDP in 2015. From insurance premiums to deductibles to coinsurance to copays to out-of-pocket expenses (and that doesn’t include the time we spend coordinating appointments and trying to make sense of our medical bills), being unhealthy creates stress and financial strain. Despite being among the highest in health-related expenditures, America continues to lag behind other countries when it comes to overall health. In the U.S., life expectancies are lower and chronic conditions are on the rise. According to a NCHS data brief on 2012 (No. 237), obesity was the reason behind 11 million visits to physician offices, and 74% of those visits were associated with an accompanying chronic condition. It’s clear that it’s time for a major disruption within the health care system. As Americans, we’ve become passive recipients of health care. Instead of owning our health, we’ve transferred the responsibility to our health care providers. In contrast, self-care is a largely overlooked and undervalued preventive health tool that offers everyday Americans the opportunity to be part of health care reform. Self-Care is a powerful, multidimensional tool that we can use to not only navigate life’s heavy moments, but to make a meaningful contribution to the world. By carefully investing our energy into key areas of our lives, we’re able to experience more beauty and joy — without the complications of chronic health conditions. For more on this, check out the article I wrote for The Costco Connection. Our traditional healthcare system focuses primarily on the physical aspects of our health — our nutritional status, fitness level, laboratory values, organ function, signs and symptoms of disease, and our mental and emotional health. 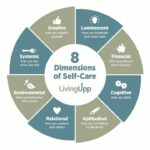 Living Upp’s unique 8-dimensional model helps high-achievers live up to their fullest potential. Download your Rate Your 8 Assessment and use it regularly. Join the Lifestyle Design Studio and get the accountability and support you need to grow into a healthier lifestyle. Grab a copy of The Self-Care Planner and incorporate the Rate Your 8 tool into the flow of your workday. Attend the virtual Lifestyle Design Retreat and begin implementing your new lifestyle right away. Get the Self-Care Starter Kit and begin mapping out a self-care practice that strengthens and energizes you. Learn more about the 8 dimensions of self-care in my book Uppward: A Self-Care System for Purposeful Living*. Learn more about the Lifestyle Design Studio here.